Objective To evaluate the effect of the 6-PACK programme on falls and fall injuries in acute wards. Participants All patients admitted to 24 acute wards during the trial period. Interventions Participating wards were randomly assigned to receive either the nurse led 6-PACK programme or usual care over 12 months. 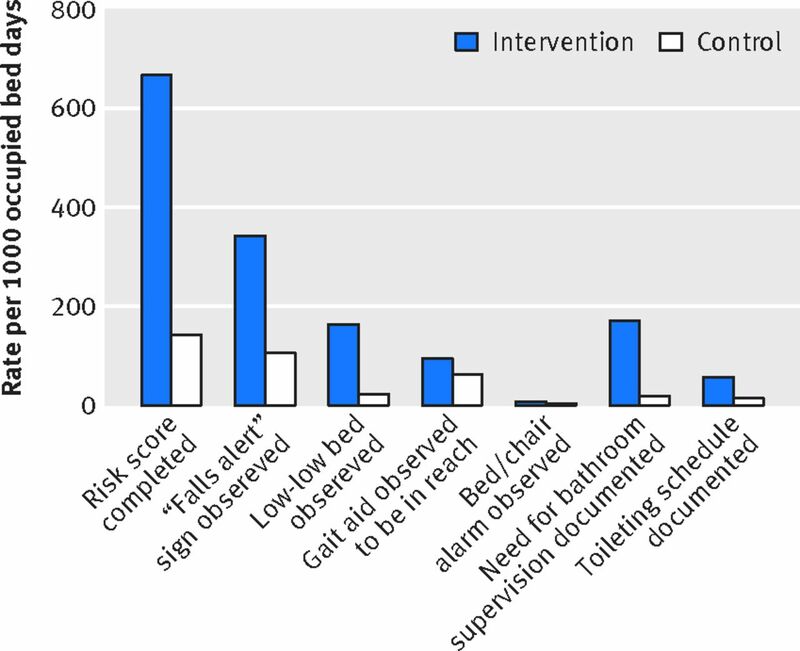 The 6-PACK programme included a fall risk tool and individualised use of one or more of six interventions: “falls alert” sign, supervision of patients in the bathroom, ensuring patients’ walking aids are within reach, a toileting regimen, use of a low-low bed, and use of a bed/chair alarm. Main outcome measures The co-primary outcomes were falls and fall injuries per 1000 occupied bed days. Results During the trial, 46 245 admissions to 16 medical and eight surgical wards occurred. As many people were admitted more than once, this represented 31 411 individual patients. Patients’ characteristics and length of stay were similar for intervention and control wards. Use of 6-PACK programme components was higher on intervention wards than on control wards (incidence rate ratio 3.05, 95% confidence interval 2.14 to 4.34; P<0.001). In all, 1831 falls and 613 fall injuries occurred, and the rates of falls (incidence rate ratio 1.04, 0.78 to 1.37; P=0.796) and fall injuries (0.96, 0.72 to 1.27; P=0.766) were similar in intervention and control wards. Conclusions Positive changes in falls prevention practice occurred following the introduction of the 6-PACK programme. However, no difference was seen in falls or fall injuries between groups. High quality evidence showing the effectiveness of falls prevention interventions in acute wards remains absent. Novel solutions to the problem of in-hospital falls are urgently needed. Trial registration Australian New Zealand Clinical Trials Registry ACTRN12611000332921. In many Western models of healthcare, acute hospitals provide care for short periods (average length of stay less than three days).19 Once patients are medically stable, they are discharged to either home, rehabilitation, or sub-acute care (average length of stay more than 17 days).19 The case mix also differs across settings; 48% of patients in acute hospitals are aged 65 and over compared with more than 70% in sub-acute settings. Sub-acute hospitals also have a greater number of allied health professionals and geriatricians than do acute hospitals, reflecting the rehabilitative nature of the care. These differences may partially explain why programmes have been less effective in acute hospitals than in sub-acute hospitals. These observational studies provide proof of concept for the effectiveness of nurse led multifactorial programmes in acute wards, but large scale randomised trials are needed to provide robust estimates of effect and evidence of generalisability. 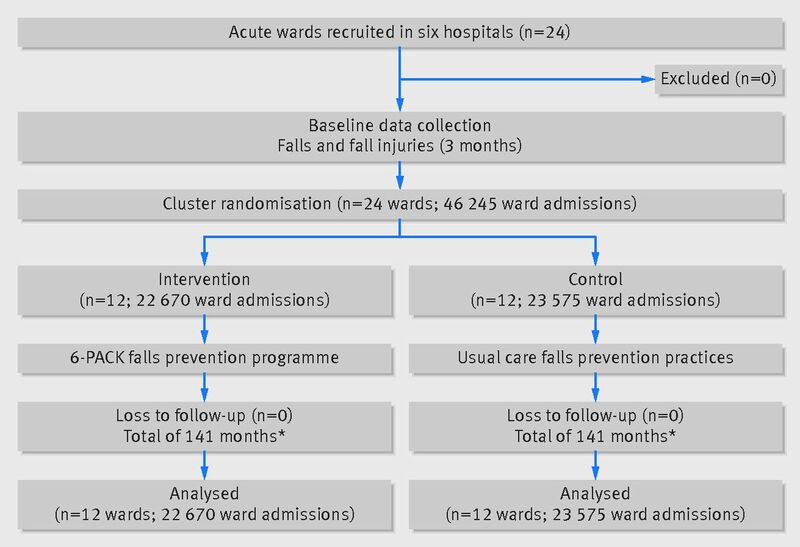 We therefore did a cluster randomised controlled trial to evaluate the effect of the 6-PACK programme on falls and fall injuries in acute wards. We used a ward based approach to reduce contamination between groups. Randomisation at the ward level was appropriate, as key aspects of the intervention were ward based. The intervention, the 6-PACK programme, replicated what was developed and evaluated in the single centre observational study.25 Appendix 1 gives a detailed description of the 6-PACK programme according to the CONSORT extension template for intervention description and replication guidelines. In brief, the programme included a nine item fall risk tool,20 as well as six interventions: “falls alert” sign, supervision of patients in the bathroom, ensuring patients’ walking aids are within reach, establishment of a toileting regimen, use of a low-low bed, and use of a bed/chair alarm. 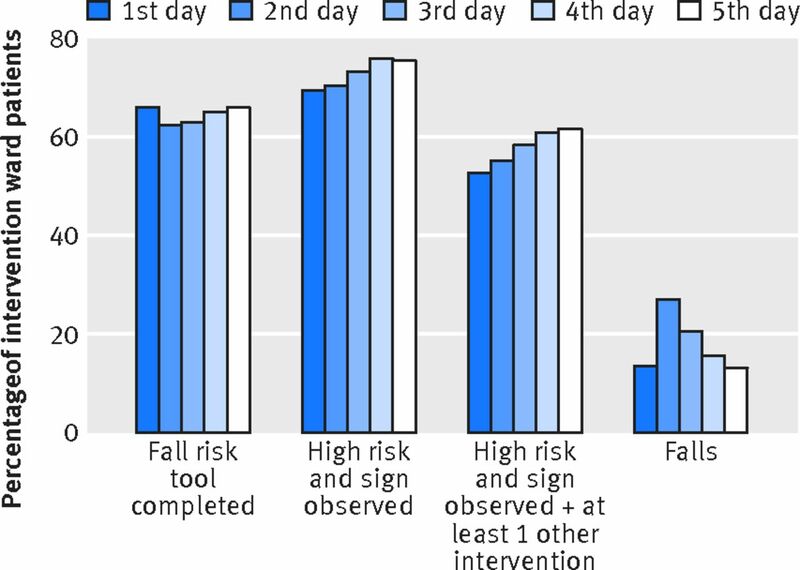 Nurses were asked to update the fall risk tool for each of their patients each shift and to apply a falls alert sign and one or more of the remaining 6-PACK interventions to patients classified as being at high risk. Selection of interventions for each patient was based on clinical judgment. The 12 intervention wards implemented the 6-PACK programme over a 12 month period. Implementation was supported by project change management and programme facilitators, a standardised implementation guide, a hospital based site clinical leader, and ward champions who conducted staff education and audits and provided reminders and feedback on the use of programme components during the trial period. Control wards were asked to continue with usual care throughout the trial period. Usual care involved falls prevention practices provided by wards as part of existing hospital policy, which may have included some components of the 6-PACK programme and other interventions such as non-slip socks, constant patient observers, and falls alert wrist bands. The co-primary outcomes were falls and fall injuries per 1000 occupied bed days. We defined a fall as “an event resulting in a person coming to rest inadvertently on the ground, floor, or other lower level.”28 We defined a fall injury as any reported physical harm resulting from a fall (including bruising, abrasions, lacerations, and fractures) with the possibility of multiple injuries per fall. Data on injurious falls (a fall resulting in one or more injuries) and fractures (vertebral and peripheral) were also reported. Fractures were verified by medical imaging. Falls, falls prevention practices, and patients’ demographic data were prospectively recorded for a three month period before the trial to inform implementation of the 6-PACK programme and provide a baseline reference period with which the sample’s characteristics and outcomes for the 12 month study period could be compared. Admitted patients’ demographic characteristics and diagnoses came from hospital administrative datasets. Diagnoses were recorded using the ICD-10-AM (international classification of diseases, 10th revision, Australian modification). We applied published algorithms to generate Charlson comorbidities from ICD-10-AM diagnoses.29 Falls data were prospectively collected via daily audit of patients’ medical records and verbal reports from the ward nurse unit manager about falls known to have occurred within the previous 24 hours, as well as monthly audit of hospital incident reporting and administrative databases. We reviewed radiological investigation reports to verify fractures. A second independent assessor reviewed and re-coded all recorded falls (ward, injuries sustained, fall location, time, and activity), and disagreements were resolved by a third. We included as an outcome event any fall recorded in any source that was verified (met the study definition and occurred on a study ward during the study period) by the second independent assessor. Process data on completion of the risk tool and use of the 6-PACK programme components were recorded by daily medical record audit and structured bedside observation by trained assessors using a standardised tool during the baseline and study period. After recruitment of wards and collection of the three month baseline data, ward pairs were defined either by being the two wards of the same type recruited at a hospital or, in the case of two hospitals where four wards of the same type were recruited, by having the most comparable baseline fall injury rates. After this, a statistician blinded to the names of the hospitals and wards randomised one ward from each pair to receive the intervention or to continue with usual care (control). In fact, in only three of the 12 pairs were baseline fall injury rates actually similar. We used the RALLOC command in Stata to develop the randomisation schedule, using a random sequence in blocks of two generated by the study statistician.31 Concealment of allocation was ensured, as the schedule was accessible only by the study statistician, who was not involved in ward recruitment or data collection. As the intervention was nurse led, blinding of ward nurses and patients was not possible. Blinding of the assessors collecting the fall and falls prevention practice data was also not possible. Assessors blinded to group allocation did the secondary coding of characteristics of falls and injuries, and the primary assessor completed the coding. A statistician blinded to group allocation (RW) did the data analysis. We linked hospital administrative datasets that contained demographic and diagnosis data to fall data (linking variables were patient’s identifier, date of hospital admission, and ward name). We used descriptive statistics to profile the sample; fall, fall injury, and injurious fall rates; and process data on the use of 6-PACK programme components (sum of total components used each observed day; maximum=7). To evaluate the efficacy and implementation of the programme, we compared rates of falls, fall injuries, and use of 6-PACK components between the intervention and control groups by using mixed effect negative binomial models, with the at risk time being each ward admission’s length of stay. Primary analyses allowed for pairing of wards by inclusion of a fixed effect for ward type (surgical or medical) and clustering of a ward’s admissions by inclusion of a random effect for ward. We did not include a fixed effect for ward pairing as recommended by Martin et al,32 as fall injury rates for the baseline period were not particularly similar within ward pairs (matching correlation was 0.14). We did a sensitivity analysis with ward pair as a fixed effect corresponding to the a priori analysis plan. Secondary analyses included adjustment in the same model framework for the pre-specified variables of age and cognitive impairment.27 We did subgroup analysis by ward type by including an interaction term between ward type and randomised group in each of the fall and fall injury models. We investigated potential contamination by examining changes in the use of 6-PACK programme components from the baseline to the randomised controlled trial period in the control wards. Post hoc analysis explored the timing of the use of 6-PACK programme components with a 100% adherence target (risk assessment completed for all patients, falls alert sign and at least one other 6-PACK intervention in place for high risk patients) and falls on intervention wards during the trial period. We calculated the percentage adherence for programme components and the percentage of falls on each of the first five days of the ward stay. We used a significance level of P<0.05 to indicate statistical significance, and all analyses applied intention to treat principles. We used Stata MP 13 statistical software for all analyses. No major protocol deviations or unexpected adverse events occurred during the study period. This trial involved 46 245 ward admissions, from 16 medical wards and eight surgical wards, during the period January 2012 to March 2013. Characteristics of admitted patients and length of stay were similar for intervention and control groups and across baseline and randomised controlled trial periods (table 1⇓). In all, 31 411 unique patients were admitted to the wards, including 3853 (12.3%) patients admitted to both an intervention and a control ward at different times during the trial period. Eighteen of the 24 wards had a trial period of 12 months (fig 1⇓). Three ward pairs had an 11 month trial period owing to ward closures. The use of all 6-PACK programme components (fall risk tool and six interventions) was threefold higher on intervention wards than on control wards (incidence rate ratio 3.05, 95% confidence interval 2.14 to 4.34; P<0.001). Use of 6-PACK programme components increased rapidly on the intervention wards after introduction of the programme at the start of the randomised trial period. No change was observed on the control wards, suggesting that contamination was unlikely. The higher use of 6-PACK programme components was sustained for the eight months of the trial period for which implementation data were collected (fig 2⇓). Budget constraints prevented collection of these data for the last four months of the trial period. 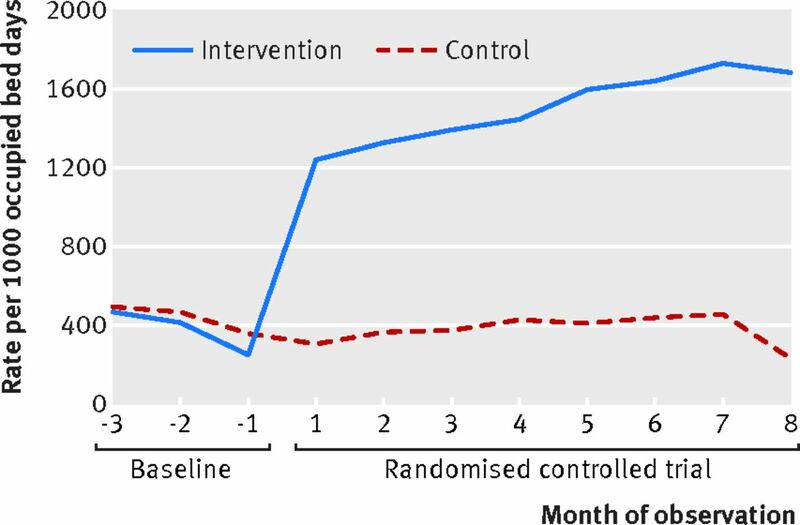 Use of individual components of the 6-PACK programme was higher on the intervention wards than on the control wards during the trial period (fig 3⇓). During the baseline period, 393 falls and 144 fall injuries were recorded for 273 fallers contributing 284 admissions. The rates of falls and fall injuries were 6.45 (95% confidence interval 5.84 to 7.11) and 2.36 (2.01 to 2.78) per 1000 occupied bed days. During the randomised trial period, 1831 falls and 613 fall injuries were recorded for 1247 fallers contributing 1333 admissions (table 2⇓). The fall rate in intervention wards was 7.46 (7.00 to 7.50) per 1000 occupied bed days compared with 7.03 (6.59 to 7.51) per 1000 occupied bed days in control wards, and the rate of fall injuries was 2.33 (2.07 to 2.83) and 2.53 (2.26 to 2.82) per 1000 occupied bed days, respectively. The fall and fall injury rates varied across wards and ward types (appendix 2). Rates of falls, fall injuries, and injurious falls remained stable across the baseline and trial period for both groups (fig 4⇓). 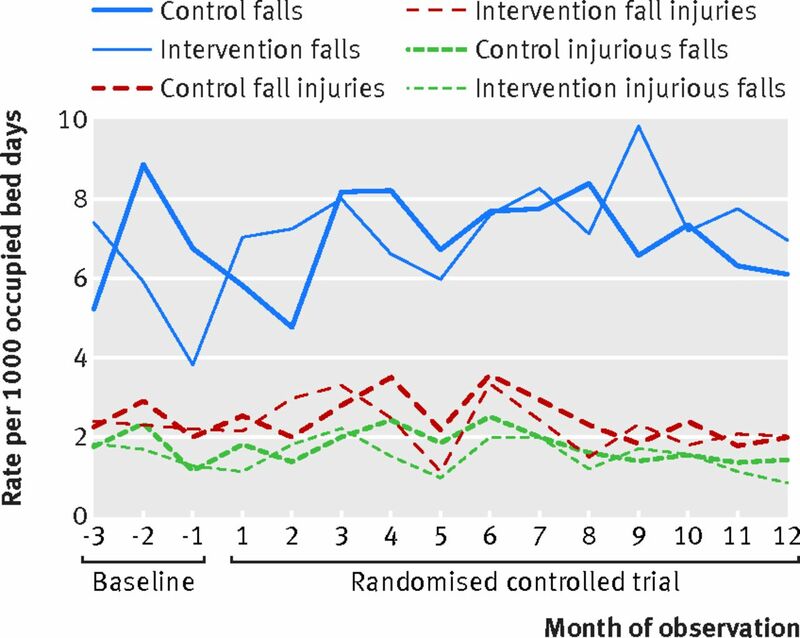 The rates of falls (incidence rate ratio 1.04, 0.78 to 1.37; P=0.796) and fall injuries (0.96, 0.72 to 1.27; P=0.766) were similar in intervention and control wards during the randomised trial period. Consistent results were observed in analyses by ward type (medical or surgical), both in primary unadjusted analyses and secondary analyses adjusted for age and cognitive impairment (appendix 3). In the sensitivity analysis that included ward pair as a fixed effect, the rates of falls (incidence rate ratio 1.04, 0.92 to 1.18; P=0.542) and fall injuries (0.96, 0.77 to 1.20; P=0.734) were similar in intervention and control wards during the randomised trial period. Visual inspection of temporal trends in fall (appendix 4) and fall injury rates (appendix 5) by ward also found no discernible trends in individual wards throughout the 12 month trial period. Figure 5⇓ outlines the timing of use of 6-PACK programme components for which there was a 100% adherence target and falls for the first five days of ward admission for intervention wards only. Completion of the risk tool was relatively stable across the first five days of ward admission, whereas use of alert signs and other interventions tended to increase. Falls most commonly occurred on the second day of ward admission. This study tested a falls prevention programme that was developed, implemented, and refined as part of usual care, with use of quality improvement methods, and for which evidence of positive effects on fall injuries existed from a single centre observational evaluation.25 Although many aspects of the 6-PACK programme represent practices that are used in many acute wards, recent reports highlight that current falls prevention practice in acute hospitals is suboptimal.1 24 The aim of the 6-PACK programme was to increase the frequency with which the 6-PACK interventions were used on the premise that increased use would decrease falls and associated harm. The trial was successful at increasing the use of these interventions, and we also found evidence of the timeliness of delivery, with a high proportion of patients receiving interventions within the first day of their ward admission. This suggests that the 6-PACK implementation strategy was effective at achieving meaningful changes in falls prevention practice and that the risk of implementation failure was low. However, data are lacking on the use of falls prevention interventions in previous studies to which this study can be benchmarked so that the level of effectiveness of the implementation can be more fully appreciated. Furthermore, the selection of interventions (except for the falls alert sign) was based on the clinical judgment of the patients’ treating nurse(s). Therefore, we did not expect that 100% of patients at high risk would receive the remaining five interventions. Appropriate use of interventions depended on case mix. Although further exploration of the implementation fidelity—including adherence to the programme and its moderating factors (hospital resources, implementation strategies, and staff responsiveness)—is planned, this analysis suggests that implementation was effective. Possible explanations for our finding of no effect include contamination, confounding, and ineffectiveness of the intervention. The results presented provide evidence that the risk of contamination was low, as the use of 6-PACK programme components was significantly lower on control wards and rates were consistent with those recorded in the pre-trial baseline period. The groups were comparable for key measured factors known to affect risk of falls, including age and cognitive impairment, suggesting that confounding due to variation in case mix was also unlikely, although there may be confounding due to imbalance between randomised groups in factors not measured (including staff skill mix; availability of mobility aids; use of benzodiazepines; falls risk factors including gait, balance, muscle strength, functional impairment, and use of walking aids; and complexity of illness). Although the interventions included in 6-PACK hold face validity, they may lack potency to effectively mitigate the risk of falls and injury. The findings of a recent meta-analysis support the concept of a lack of potency of multifactorial falls prevention approaches—assuming a rate of 8 falls per 1000 occupied bed days, the number needed to treat to prevent a single inpatient fall is 1250 patient days.39 This represents one fall prevented every six weeks in a standard 30 bed ward and assumes a small treatment effect of 0.9 (odds ratio) generated from pooled effects of five non-randomised clinical trials and one randomised trial. Potency may be limited by a reliance on behavioural change from both the nurses and the patients. Study limitations warrant consideration. Importantly, hospital sampling was done at convenience. The participating hospitals may therefore not be representative of the broader population of acute hospitals in Australia or internationally. The assessment of cognitive impairment was based on ICD-10 codes recorded in routine hospital datasets, which are likely to have been under-coded.40 We used multiple data sources to identify primary outcomes, but falls and fall injuries may have been reported more on intervention wards owing to increased awareness of falls with 6-PACK implementation. However, we saw no significant change in reporting of falls outcomes between the baseline and intervention periods on the control or intervention wards. Similarly, although process data on the use of 6-PACK interventions were recorded by assessors who were aware of group allocation, rates of use of 6-PACK component in control wards were comparable across the baseline period before wards were randomised, and group allocation was revealed, and the randomised trial period when ward allocation was known. Therefore, we consider that the risk of reporting or detection bias in this study was low. All fall events were also double coded (event meets fall definition, injuries sustained, ward and fall characteristics) by a second assessor who was blind to the ward allocation and the codes assigned by the first assessor to minimise reporting bias. The findings of this study are in accordance with those of previous randomised controlled trials and observational studies, which together provide increasing evidence of no effect for falls prevention interventions in the acute hospital setting. The Cochrane review published in 2012 included four multiple and eight single intervention studies in acute hospital samples and concluded that limited evidence existed to support any one intervention.14 Of the four multiple intervention studies, two showed no effect on falls,30 41 and two reported a reduction in falls.16 42 Both trials that reported a reduction in falls were single centre in design, recruited individual patients to participate in the study (rather than including all patients admitted to study wards), required additional staffing to implement the intervention, and collected falls data from a single source only. These factors limit the generalisability and validity of the findings of both of these studies to the broader acute care population. The method for collecting falls data for hospital based trials should incorporate multiple sources.43 Recruitment of individual patients to a study often results in a sample with under-representation of patients who are acutely unwell, require interpreters, or have cognitive impairment, therefore limiting generalisability. In addition, the study by Stenvall et al included only patients with hip fractures and reported a total postoperative observation period of 2860 days for the 102 intervention participants,16 suggesting that the study population was more representative of the sub-acute setting. Further trials are needed to confirm the effects reported in these two studies. The eight single intervention studies in acute populations included in the Cochrane review also found no effect on falls. They tested bed exit alarms,44 a behavioural advisory service for people with cognitive impairment,45 multifaceted guideline implementation,46 47 an acute care for the elderly service,48 a computer based falls prevention tool kit,49 multimedia patient education,50 and low-low beds.35 Two additional randomised controlled trials have investigated single interventions for falls prevention in acute wards and were not included in the Cochrane review. One tested bed exit alarms and found no effect on falls36; the other tested shock absorbing flooring and reported fewer falls with injury.51 Although these latter results highlight the potential benefit of shock absorbing flooring, the study was only a pilot trial including a small number of patients, so a larger trial is needed to confirm the effects. A recent review that included eight randomised and non-randomised comparative studies in US acute hospitals also reported that multifactorial interventions had no effect on falls and concluded that further research is needed to provide evidence on how hospitals can successfully prevent falls.52 This finding is consistent with a review of 17 international randomised and non-randomised comparative studies, of which 13 included acute wards, which concluded that there was a lack of evidence for reducing falls in hospital populations with a shorter length of stay.18 A frequent limitation of previous studies is that they have been underpowered to detect differences in rates of fall injury. In conclusion, greater use of the components within the 6-PACK falls prevention programme had no effect on falls or fall injuries in the 12 acute intervention wards that participated in this trial. Although the substantial harm and negative consequences of inpatient falls are unquestionable, high quality evidence showing the effectiveness of preventive interventions for falls in acute wards is lacking. Epidemiological data are also lacking to support the idea that the increased focus on falls prevention in hospitals via introduction of guidelines, accreditation standards, and quality improvement initiatives has had any effect on falls or their consequences. System level interventions, environmental interventions, or both may offer improved potency and effectiveness and should now be the focus of further investigation. We acknowledge the contribution of Sheral Rifat and Darshini Ayton in the preparation of this article; the Injury Prevention Unit, The Northern Hospital, Northern Health, Melbourne, Australia, who developed the 6-PACK programme; and the late Damien Jolley, who provided substantial input to the design of the 6-PACK project. The study could not have been completed without the collaboration and support from the participating hospitals, site clinical leaders, and nursing staff. Contributors: ALB led the conception, design, and application for funding of the project in conjunction with CAB, TPH, KDH, SGB, MB, RGC, PML, CS, and SZ. ALB, RTM, JK, CAB, TPH, KDH, SGB, MB, RGC, PML, CS, and SZ participated in the steering committee and project governance. RIL was a study site investigator. ALB led the drafting all sections of this manuscript except the results in consultation with all of the co-authors. RTM managed the collection and verification of data and led the drafting of the results section of this manuscript. RW was responsible for the analysis and interpretation of data. All authors reviewed and revised the manuscript critically for important intellectual content. ALB is the guarantor. Funding: This project was funded by the National Health and Medical Research Council (NHMRC), Australia (APP1007627). ALB’s salary was funded by a career development fellowship from the NHMRC (APP1067236). RTM’s salary was supported by a postgraduate scholarship from the NHMRC (APP1055604). TPH’s salary was funded by a career development fellowship from the NHMRC (APP1069758). CS’s salary was funded by a career development fellowship from the NHMRC (APP632929). The funders of the study had no role in study design, data collection, data analysis, data interpretation, or writing of the manuscript. ALB, RTM, and RW had full access to all the data in the study, and the corresponding author had final responsibility for the decision to submit for publication. Competing interests: All authors have completed the ICMJE uniform disclosure form at www.icmje.org/coi_disclosure.pdf and declare: no support from any organisation for the submitted work other than that detailed above; no financial relationships with any organisations that might have an interest in the submitted work in the previous three years; no other relationships or activities that could appear to have influenced the submitted work. Ethical approval: This study was approved by Monash University Human Research Ethics Committee (CF11/0229, 2011000072) and each of the relevant hospital ethics committees. Data sharing: A full dataset that includes patient level data, technical appendix, and statistical code is available on reasonable request from the corresponding author. Individual patient consent was not obtained, but the presented data are anonymised and risk of identification is low. Transparency statement: The lead author (the manuscript’s guarantor) affirms that the manuscript is an honest, accurate, and transparent account of the study being reported; that no important aspects of the study have been omitted; and that any discrepancies from the study as planned (and, if relevant, registered) have been explained. Royal College of Physicians. Report of the 2011 inpatient falls pilot audit.RCP, 2012. National Institute for Health and Care Excellence. Falls: assessment and prevention of falls in older people.NICE, 2013. Australian Commission on Safety and Quality in Health Care. Preventing falls and harm from falls in older people: best practice guidelines for Australian hospitals.ACSQHC, 2009. American Geriatrics Society, British Geriatrics Society. AGS/BGS clinical practice guideline: prevention of falls in older persons.American Geriatrics Society, 2010. Center for Performance Sciences. Acute care implementation manual: international quality indicator project.Centre for Performance Sciences, 2006. Australian Council on Healthcare Standards. National Safety and Quality Health Service Standards Program.ACHS, 2012. Australian Institute of Health and Welfare. Australian hospital statistics 2011-12.AIHW, 2013. Barker A.. An evaluation of the preventing falls and harm from falls in older people best practice guidelines for Australian hospitals.Monash University, 2012. Ryan P.. Ralloc: Stata module to design randomized controlled trials.Statistical Software Components, 2011.